Science inspires me more than anything else (it would have to, or grad school would definitely be off the table! ), and besides the sweat, blood, and tears normally dedicated to this pursuit, I believe that body art is a beautiful medium for celebrating this passion. I got my first tattoo too late to be included in Zimmer’s book (alas! alack! ), but did make it onto his National Geographic blog with this beautiful line-drawing of a Dicranurus trilobite. As I say on the website (click image for the link), I was inspired to fossil-hunt as a young child by my geologist parents and had, in all seriousness, the best trilobite collection of any six year old in northern United States. Trilobites, for the unfamiliar, are not aliens – despite all appearances to the contrary. They were one of the most prolific arthropods in all of evolutionary history, ranging from the mundane and button-looking to the highly ornamented creature crawling between my shoulder-blades. Their evolutionary history and biology is fascinating (their eyes, for example, are made of calcite – a kind of mineral! ), and I highly recommend Richard Fortey’s book, “Trilobite!”, for anyone wanting to learn more. 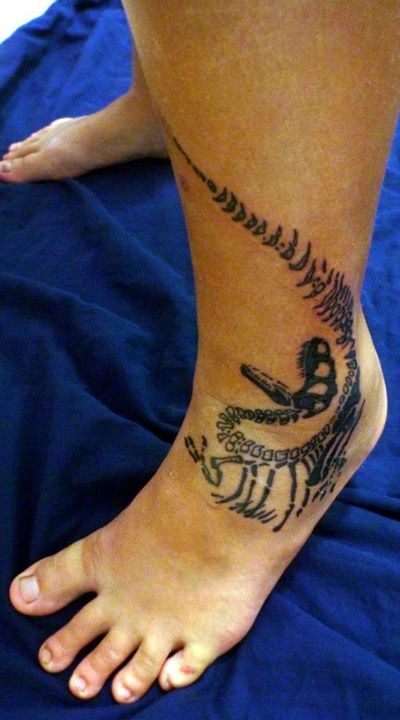 Continuing to mine the fossil vein, my second tattoo features an allosaurus in the classic preserved “death pose” – not to be confused, of course, with “death throes”. The thrown back head and gaping mouth arise after death as the body of the organism dries and is shuffled around by its environment. 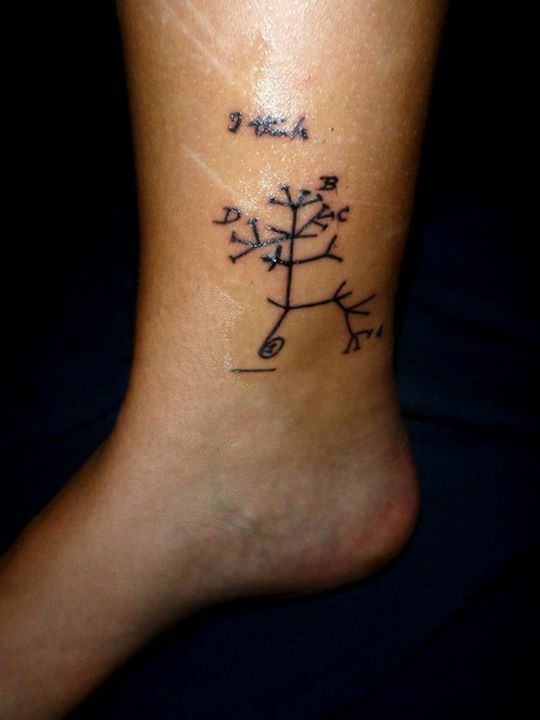 Adoring my other ankle is a tattoo I see fairly commonly among biologists, in particular, evolutionary scientists. Anyone recognize this image? I bring all this up because yesterday I completed a second sitting for my newest science tattoo. It’s all red and healing and kind of sore right now, but hopefully I should have pictures to show soon! A homage to the birthplace of evolutionary ideas — to be revealed at another time. Not sure I should thank you for this post. Your links led to other links and the pattern is starting to look like your tattoo of Darwin’s tree of life. This could take all day. The trilobite is beautiful, looking forward to the latest one. Very cool ink. I have been thinking about getting an allosaurus death pose tattoo, myself. I just have too many “science hobbies,” and can’t decide which one to commemorate first. Enjoyed the post!